Night Ranger really needs no introduction but 1982-1989 saw them release five albums which sold more than 10 million copies altogether. From humble beginnings as STEREO Jack Blades, bass, vocals, Kelly Keagy, drums, and Brad Gillis, guitars, have really made it. When changing their name to NIGHT RANGER, adding Jeff Watson, guitars and former MONTROSE keyboard player Alan Fitzgerald their fortunes changed. Most famous track must be the ubiquitous power ballad “Sister Christian” and most successful album must be 1985´s “Seven Wishes”. In 1989 the band split but returned in 1991 with some half-hearted lineup. 1996 to 2003 saw the originals return, but since Jeff Watson and Alan Fitzgerald have left the fold. The band remains highly popular not least in the Far East. This album sports the line up of Jack Blades, Brad Gillis, Kelly Keagy and guitarist Joel Hoekstra and keyboard player Eric Levy who have been around since 2008 and 2011 respectively. As the years go by NIGHT RANGER have not become heavier, but here you can spot the occasional 80´s OZZY riff, for whom Brad played a short few weeks when the band was on hiatus. Opener “High Road” is more car rock by the champions of it. Their brand of American story telling paired with impeccable arrangements is hard to beat. Their first shot at “Shot in teh Dark-era” OZZY is “Knock Knock Never Stop” as far as the riff goes, the rest is Jack Blades Americana. The bluesy MOR of “Rollin´ On” is more hey hey hey yeah but with conviction. 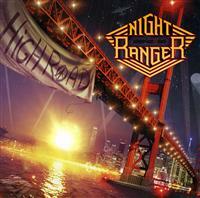 “I´m Coming Home” has a refrain that most musicians would kill for, but it is still only Monday at work for NIGHT RANGER. The majestic “Don´t Live Here Anymore” is a display of arrangements as they build up the track from Jack almost alone to a JON LORD echoing keyboard solo alongside increasing intensity which equals master class. To make a long story short the only lame moment is the less inspired or less forceful “Brother”, which is the closest to a filler you´ll get here. Another lesson in musicianship from San Francisco’s finest!